This is not a regular issue coin but, rather, a proposed or speculative issue. Varieties were minted in silver, pewter and brass and sometimes the word CURRENCY was spelled “CURENCY.” It also lacked the designers initials (represented on some coins as “EG FECIT,” which is believed to signify that the design was by Elisha Gallaudet). It is probable that these coins did circulate in colonial America and that they did have a recognized value. This fact makes them a legitimate candidate for the first “dollar” struck in this country as well as the largest coin, in terms of size, issued prior to the establishment of the United States. The date 1776 makes them even more desirable, in the opinion of some collectors. The design on the reverse (featuring thirteen interlinked rings with the name of each colony and symbolizing unity) is believed to have been suggested by Benjamin Franklin. Most of these surviving coins saw only light circulation during the colonial era and were well struck. Such a coin would cost $7,500-$10,000. Uncirculated coins could go for six to ten times as much. 1. Alexander, David T., and DeLorey, Thomas K., Coin World Comprehensive Catalog & Encyclopedia of United States Coins, World Almanac-Pharos Books, New York, 1990. 2. Breen, Walter, Walter Breen’s Complete Encyclopedia of U.S. and Colonial Coins, Doubleday/FCI, New York, 1988. 3. 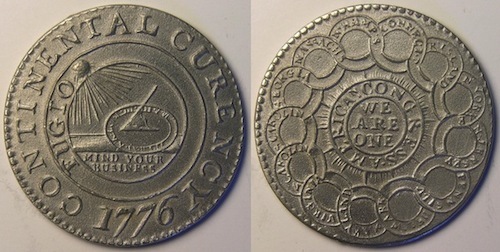 Hodder, Michael J., “The Continental Currency Coinage of 1776, a Trial Die and Metallic Emission Sequence”, The American Numismatic Association Centennial Anthology, Colorado Springs, CO., 1991. 4. Mossman, Philip L., Money of the American Colonies and Confederation, a Numismatic, Economic & Historical Correlation, American Numismatic Society, New York, 1993. 5. Newman, Eric P., The 1776 Continental Currency Coinage-Varieties of the Fugio Cent, Wayte Raymond Inc., New York, 1952.